Since we moved in I’ve been saying that I would spray paint the garbage cans so there would be no mix up when we take them to the curb. Everyone else’s is marked so this is not a ‘this is mine, don’t touch it!’ sort of thing. You just never know if your garbage can will go blowing down the city block after it has been emptied. 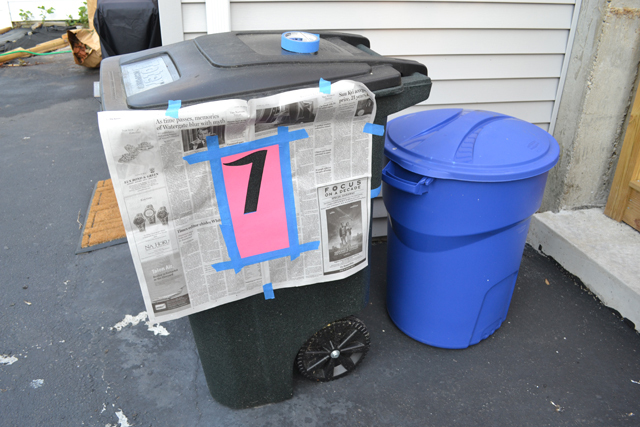 I didn’t just want to freehand spray paint the cans with our house number… I wanted to give them some curb appeal!! Wear gloves. I only put gloves on for the last # and now part of my left hand is bright green even after scrubbing the crap out of them. Make more stencils. 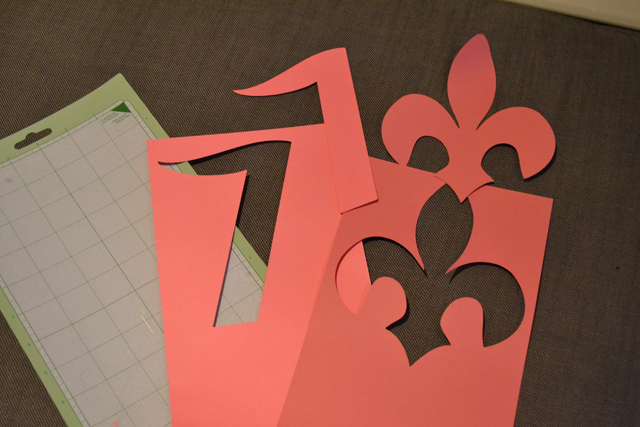 I only made one ‘7’ and one ‘fleur de lis’ thinking I would just reuse it. Unfortunately, it was getting tricky at the end to reuse them and not make a horrible mess on the trash cans & my hands (see above). Should have listened to Pricer! Mask the stencils differently. I would first position the stencils and then put the mask on. I think it would have allowed me to work easier and get crisper lines as the stencil would have been taped right to the can. I’ve written out directions below on how I would do it next time. Once I sprayed on the first things I realized immediately the mistakes I made setting us up. 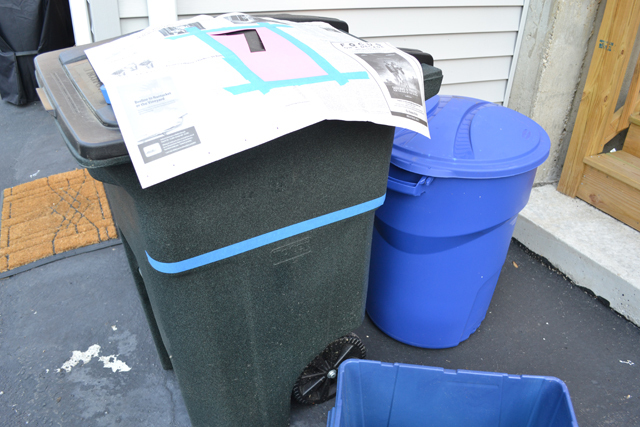 Follow the directions below and you will have an easy time labeling your trash cans. Curb appeal… I was thinking of doing a pineapple on the trash cans but our mailbox has a fluer de lis already on it so I went with that. Pick a symbol that you like to enhance the overall look! *I really suggest getting Rust-oleum’s Painter’s Touch Ultra Cover. This works on a variety of surfaces, including plastic, and there were a lot of nice colors. I used Key Lime. Identify where you want the number and/or symbol to go on the trash cans. 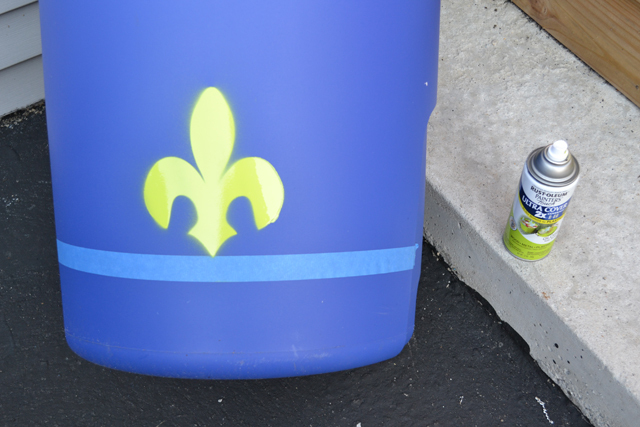 Put a strip, or several, of painter’s tape on the trash can to create guides to position the stencils. Use a rule to help center or keep lines level, as needed. 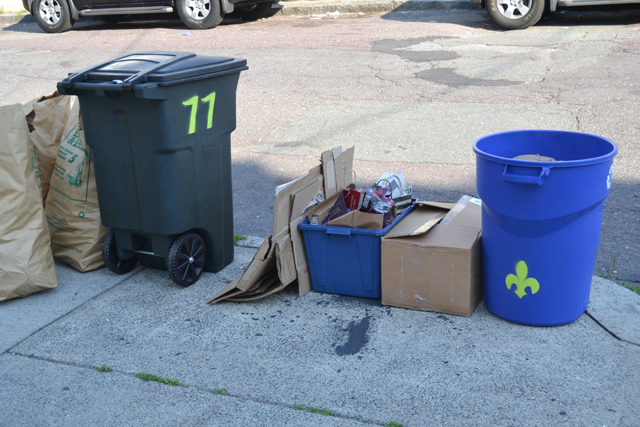 Tape the stencils(s) to the garbage can. Cut a piece of newspaper the size of the stencil in the center of the piece of paper. 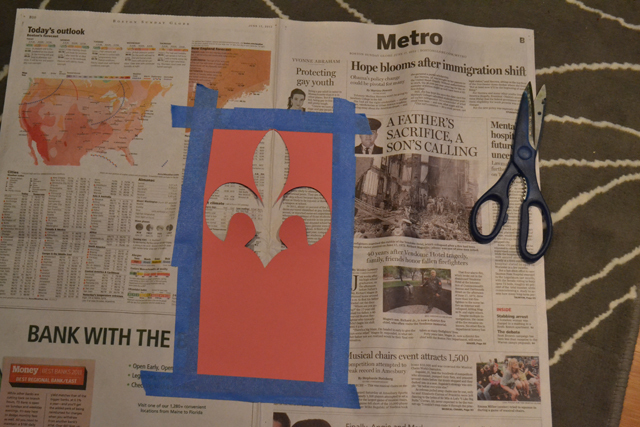 Place the newspaper shield over the stencil and tape into place. While wearing gloves, evenly and gently spray paint the can at the stencil. Remove the newspaper shield and the stencil gently. Lastly, remove the tape guides from the trash can. Great idea! We used to chase our cans down the street, after the bears got them. lol! that’s a fantastic idea!! and the fleur de lee looks awesome. This is such a good idea! 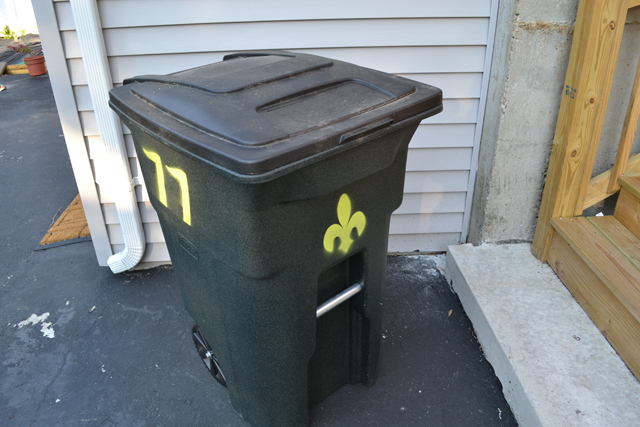 Our garbage cans are always getting blown around so it would be nice to have them labeled and with something so cute! You might want to also go to art school since I think your job was quite lame. Sorry. As a professional graphic artist, I can say with some authority that you did a good job and can ignore evergreen. Looks like some time has passed. How have your stencil designs held up? I’m not an expert, but doing my research as I have to supply my own can for lawn waste. I’ve read there is a special paint for plastic that can go for $12 a can. The surface to be painted should be sanded??? There is also a recommended clear coat to use???? I don’t need art. I just don’t want to be buying replacement cans. I had a smaller recycling basket and that disappeared 3 times. Are there more recommendations now?